Quarztfire is this nifty piece of software built to scale to individual business needs. Through a combination of base modules and custom coding, Quartzfire can integrate with any business process, matching and improving what was already there. Take the leap to try something new and change your business for the better. What industries does it help and how does it do it? How does Quartzfire work? How does it do what it does? Quartzfire is a system built to handle and organize your data. That data could be from any kind of industry and Quartzfire can still draw the connections needed to crunch your numbers. This digital filing system could be used on anything. And the best part? It could be used anywhere too. Use Quartzfire with a manufacturing operation to log your paperwork, relieving your workers from the stress and mess of print while still getting all of your information. Not only that, but Quartzfire will automate processes and connections, handling what would take hours of manpower in a matter of seconds. If you work in steel and plastic recovery, you can forget about those pesky reports and papers that you have to keep track of. Instead, your whole system is stored in this handy tablet, able to swap between forms with a press of a button. From there, Quartzfire can print any form you use for filing purposes. 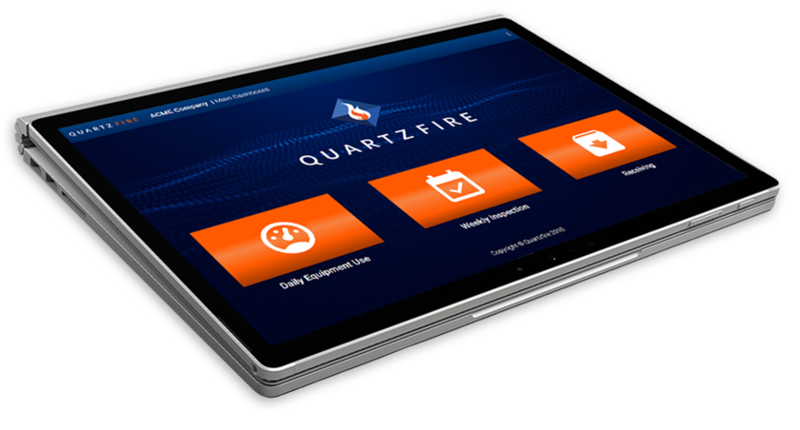 Retail management has never been simpler than with Quartzfire. Receive, edit, and manage inventory from a single system. Perform your transactions, manage your employees, and export all your sales reports from a single piece of software. With flawless documenting, Quartzfire will keep your records clean and exact. Streamlining your workflow doesn’t need to be difficult. Let Quartzfire be your tool that handles system communications. Automate the process of documentation and rely on impeccable record keeping to keep your affairs in order and on track. Build upon the base modules to create a system tailored to your business. Quartzfire is built out of modules, or condensed little packages that serve a universal purpose. The foundation these build are a catch all, must have for any operating business, allowing for accurate record keeping, communications of systems, and eliminating the need to repeat a single process multiple times. Businesses rely on their systems and processes to function. The more efficient the process is, the more time saved, the more work being completed, the higher the return on investment. If you’re still using paper means or are trapped in revisiting old outdated records in a binder, it may be time to streamline. Quartzfire can customize your forms to integrate with your current forms, eliminating unnecessary back and forth. Often it can be difficult integrating outdated technology with modern equipment or software. Reporting is about communication of information to the right people the right way at the right time. Quartzfire provides a customized reporting experience tailored to the data you are collecting, constructed to integrate into your existing process. Don’t adapt to the report, make the report adapt to your needs. Your website is your portal to the rest of the world, speaking to clients and vendors alike. When efficiency is key, Quartzfire will integrate and connect your internal systems to your website. Manage your inventory, order information, and project status in real time. Businesses rely on their systems and processes to function. The more efficient the process is, the more time saved, the more work being completed, the higher the return on investment. If you’re still using paper means or are trapped in revisiting old outdated records in a binder, it may be time to streamline. Quartzfire can customize your forms to integrate with your current forms, eliminating unnecessary back and forth. Reporting is about communication of information to the right people the right way at the right time. Quartzfire provides a customized reporting experience tailored to the data you are collecting, constructed to integrate into your existing process. Don’t adapt to the report, make the report adapt to your needs. Your website is your portal to the rest of the world, speaking to clients and vendors alike. When efficiency is key, Quartzfire will integrate and connect your internal systems to your website. Manage your inventory, order information, and project status in real time. Now how does one get their hands on this amazing package? What does it involve? Let’s take a look then on how you could become a Quartzfire partner. Pay a subscription fee for as many individual installations as your business needs. When you have a large operation that needs access on many different machines, license per user is your best bet. Pay for the individual license and installation per device, allowing multiple employees access on the designated device. When you need a lot of users and few devices, license per device is the way to go. Quartzfire is a growing and expanding system, built to breath. Is Quartzfire still suiting your company? Are you expanding and require new features? Having trouble or your workers need a different process implemented? As need change or or new needs crop up, Quartzfire can adapt to match. Our team behind the system continue to build capabilities as clients request them and are prepared to consult and tailor your license as you need it. Quartzfire is a piece of software that we’re continuing to build upon and refine. Installations of Quartzfire will require periodic updates to keep up with overall software updates and compatibility with hardware. Luckily, we’ll handle that for you to be sure things remain operating at max capacity. With regular reviews, assess your input vs output vs needs. Quartzfire can go a long way to smooth the road, but it takes attention to detail to identify pain points and ease of use optimizations. Luckily, out team of professionals will take the time to review your installation against growing needs to help maximize your efficiency in use. We’re the experts in software and interface, but you’re the ultimate expert on your business and goals. We take the time to consult and discuss what you want to see out of our product so that your installation can be be specially customized into what you actually need. It’s our job to take your new ideas and convert them into an functioning piece of the system. So whatever your workflow, whatever your change or request, we’ll find a way to turn your Quartzfire installation into the perfect system. So brainstorm away and see just what your software can do for you. Every new piece of software has a learning curve, and we aim to make the transition to Quartzfire smooth and easy. Our team offers both onsite and remote training to guide your users through the system. If you should ever run into any hurdles or confusion, we’ll be happy to help you get back on track. A perfect system is customized to needs, and that’s just what Quartzfire can do. Your initial launch of Quartzfire will be tailored to initial specs, but what about when new needs arise or the old change? No problem. Implementing a new report or a new form is no problem. Businesses change and grow, and so too can your process. Got ideas for additional controls of your system? Global settings or new connections can be set up so the information int eh system is being produced and managed just how you like. Implement exports and integrations when you need it to interact with an external system, such as for accounting or spreadsheets. Stop sinking massive amounts of time into information management. We have the technology, it’s time to use it. Let Quartzfire be the tool that helps smooth the road for your business to focus on growth, production, and sales. Know that reliable information management is in place to support you moving forward. Quartzfire offers products with a prebuilt framework, customizable to business needs and intended to simplify working processes. Check them out below! Paradynamix is a web and programming focused service team, made up of a unique blend of talents and individuals. Through those talents, we seek to provide our clients not with a generic quick fix, but a solution that will help them grow and build their business. © 2018 Paradynamix, LLC. All Rights Reserved.